Coal-fired power plants work hard to heat and cool homes, but burning coal releases carbon dioxide that will need to be managed in the future. Sequestering the gas can mean capturing it, stripping it away from other pollutants, compressing it, and finally injecting it into underground reservoirs. The conventional picture is that, in the last step, the carbon dioxide flows underground where it encounters water and forms carbonic acid, leading to mineral formations that trap the carbon. At Pacific Northwest National Laboratory, four scientists just turned that wisdom upside down. Using extremely detailed computer simulations, they found the desired minerals, or carbonates, can form even without water-slurping carbonic acid. Instead, just a small amount of water is needed, but it needs to be in the right spot. Coaxed out of the carbon dioxide liquid, even at the low concentrations of 1 water molecule for every 10,000 carbon dioxides, the water forms an extremely thin layer around the target mineral, in this case, anorthite. Once the layer forms, water starts eating away at the mineral surface, leaving tiny atomic voids. Enter carbon dioxide, filling in those empty spots and mineralizing in minutes. The traditional view of the mineralization process involves some very slow chemical reactions between carbonic acid and the host reservoir rock that take centuries or even millennia to convert a significant amount of injected carbon dioxide into carbonates. "This work shows a second, completely independent pathway to form carbonate minerals that is much faster than through carbonic acid formation in water thus dramatically improving prospects for mineralization to play a significant role in long-term carbon storage," said Pete McGrail, a PNNL Laboratory Fellow and manager of the project. And carbon sequestration is just the tip of the benefits that could come from this study. Why? Because the work provides insights into buried interfaces. In carbon storage, the spot where the carbon dioxide meets the target minerals is buried and hard to access by experiment alone. Think of it like trying to study what happens to an orange's seeds. You can't get to the spot where the seeds meet the surrounding fruit, the interface, without ripping apart the fruit. This study shows how to simulate these interfaces and calculate the energy involved—potentially leading to more efficient batteries, biofuel reactors, and solar cells. Vanda Glezakou and her colleagues Mal-Soon Lee, McGrail, and Roger Rousseau were investigating the nuances of carbon sequestration, the atomic and molecular details involved in mimicking Mother Nature's ability to remove gaseous carbon dioxide from the air and hold it in a solid form. In this case, the solid form is the mineral carbonate. They had an interesting set of results regarding the charges on the anorthite surface, a common silicate mineral, after it was exposed to dry or water-saturated supercritical carbon dioxide, which dissolves materials like a liquid, but moves through solids like a gas. Using DOE supercomputing systems, the team ran extremely detailed simulations to understand the mineralization process. The studies included trajectory simulations that tracked the motion of thousands of electrons and nuclei of hundreds of atoms in millions of different structures to estimate the reaction free energy. "These are not easy simulations to perform," said Rousseau. "This was something the scientific community couldn't do—even just five years ago." The simulations showed how water molecules floating around in the supercritical carbon dioxide self-organize in a film and dissolve part of the anorthite surface along the way. The water pulls out positively charged calcium cations to create holes, or defects. Around these defects sit negatively charged oxygen atoms. These atoms quickly connect up with the incoming carbon dioxide and form the desired mineral. The water layer forms slowly at low concentrations, but once in place, it prepares the stage for carbon dioxide to transform quickly. Next, from these simulations, the team wanted to extract the necessary data to determine the energy needed to form the water layer. 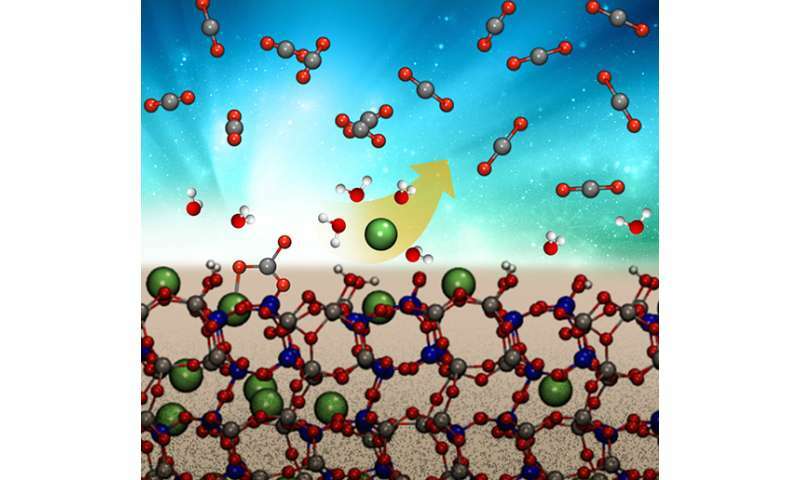 They found that the reaction occurs without an energetic push, but the position of the water molecules as they come in to form first "puddles" of water that connect into a film as they grow bigger. "Many experimentalists are interested in carbonation in mineral surfaces," said Lee. "We showed how it could happen and the energy calculations involved in this mineral formation." "Our formulations have significant consequences—for determining the proper reference of many processes—that are often ignored in computational studies of this type," said Glezakou. "Our approach has applications to many things—from energy storage, to manufacturing, to water purification." Marble or limestone manufacturing next? Maybe a pyramid or two?